Luton Town boss Nathan Jones is determined to make his second stint at Kenilworth Road a far more memorable one than his first. The 42-year-old was appointed as Hatters manager on Thursday, rejoining the club where he spent the 1995-96 campaign as a player. Jones had been signed from Merthyr Tydfil by David Pleat for £10k in the summer of 1995, but with Pleat leaving two weeks later, the Welshman never made it on to the field in a first team game for his new club. He eventually went to Numancia and Badajoz in Spain, before returning to England, but learnt some lasting lessons from his spell with Luton, saying: “I don’t think it was too memorable, but I thoroughly enjoyed it, I loved it. “It was an opportunity I had, where I could have gone to a Premier League club in Coventry or come here, but it kind of shaped me a little bit when I came here. “Because how David Pleat spoke to me on securing my signature, is how I would want to speak to people. “The coaches that were here, Wayne Tuner and John Moore, really gave me a structure of how to coach and how to plan and that carried me on for 20 years as a player and I’ve remembered those principles. “It shaped me quite a lot, I liked the place, there were good people involved then, there’s good people involved now. 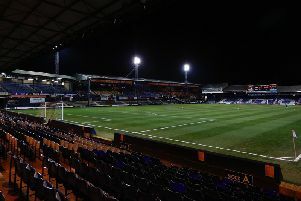 Town chief executive Gary Sweet also felt that the experiences Jones gained from his short stay at the club can only benefit him during his reign. He continued: “Nathan’s time at Luton Town was as he said now, not exactly legendary, but very, very important to us, as David Pleat bought him here. “So the type of football that Nathan came into in his first professional contract has kind of been a little bit indoctrinated into his thought processes.